What is the worst episode ever of Wait What Really OK? This one! 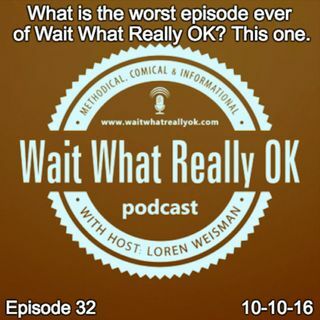 Wait What Really OK Podcast Episode 32 hosted by Brand Precision Marketing Strategist and Counselor, Loren Weisman, delivers the worst episode ever. With a hurricane about to bear down and power loss coming, I moved out my interview with Dan from Purple and replaced it with a filler show for iHeartRadio to keep the continuity. While its far from my best episode and easily the worst, I still wanted to have something ... Más informaciones go up on Monday. Podcast Blog Supplement for Episode 32 of the Wait What Really OK Podcast with Loren Weisman. Podcast Link Supplement for Episode 32 of the Wait What Really OK Podcast with Loren Weisman. What are you saying that doesn’t need to be said? Lose the fluff. Podcast Video Supplement for Episode 32 of the Wait What Really OK Podcast with Loren Weisman. Podcast Photo Supplement for Episode 32 of the Wait What Really OK Podcast with Loren Weisman.